Where would the ideal location for you to build your dream home be? Many dream about living somewhere by the beach and others prefer the peacefulness of the country – you can picture this… a peaceful place to live, away from all of the noise of the city, away from traffic, pollution, and irritated people. You can envision living in a place like the one we see above, where life slows down and you finally have more time to sip a cup of coffee on the porch, feel the wet morning grass under your toes and breath fresh air while hearing the birds in the trees. 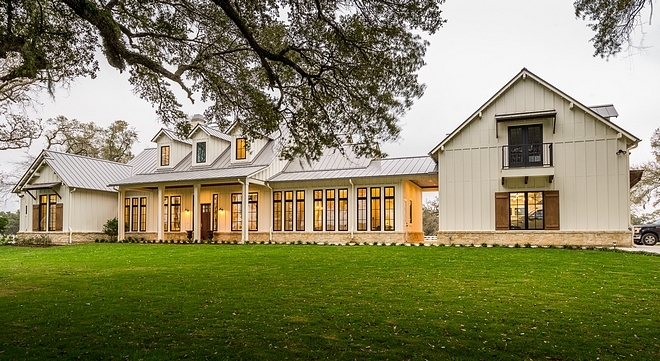 Designed by Wyrick Residential Design and built by William David Homes, this Texas modern farmhouse is set on 3 acres of a larger 150 acre parcel covered in century oaks. 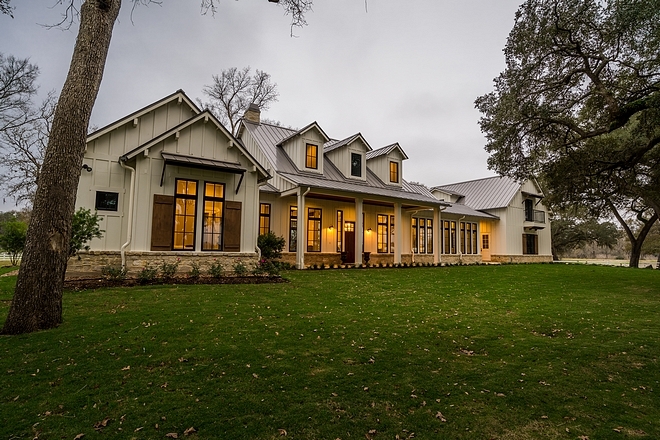 The land is located in northwest Houston’s Waller County and this home is all about living a calmer and better life. I hope it inspires you. Exterior Paint Color: Sherwin Williams Natural Choice. 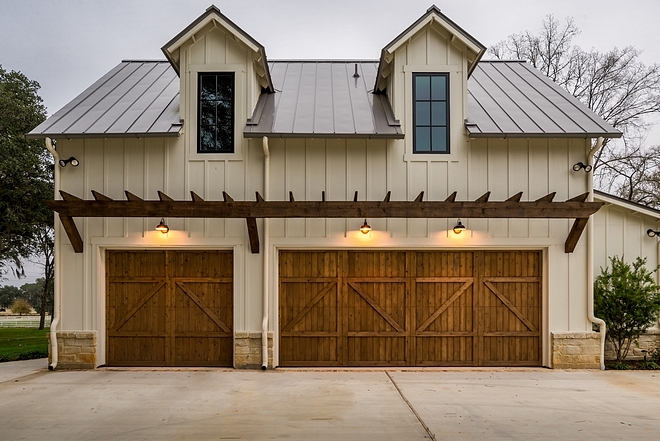 Rafters add a farmhouse-look to these custom garage doors. Barn Lighting: 8″ Bracket mounted Black Barn Lighting. Windows are Anderson E Series black windows. What a curb-appeal, right?! The custom shutters are Cedar – similar here. 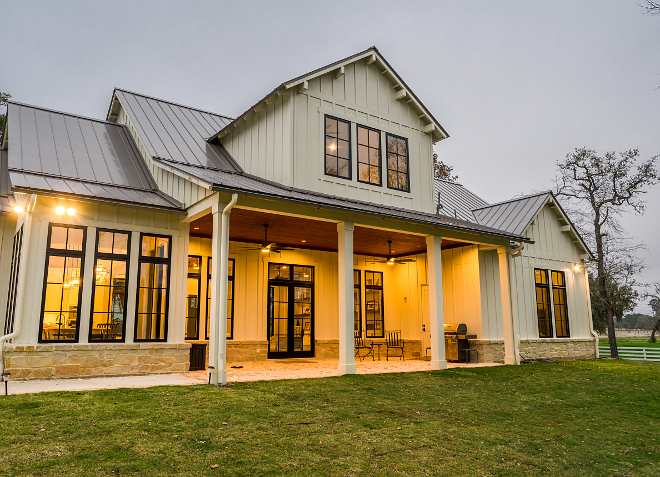 The front porch of this farmhouse features black windows, metal roof and a welcoming wooden front door. The porch ceiling is 1×6 tongue and grove – custom stained. 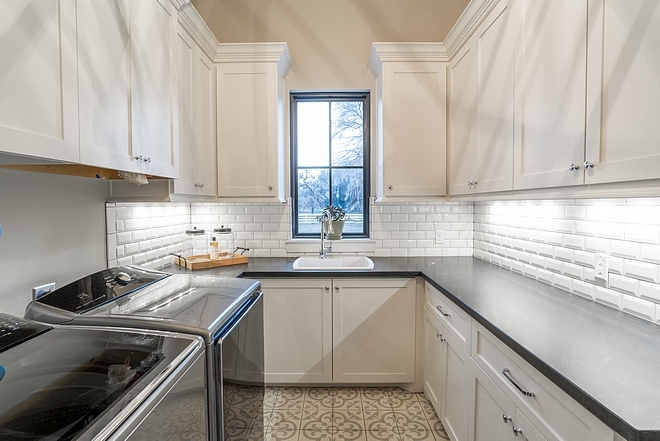 This home features a beautiful kitchen with a long grey island. The perimeter cabinets are painted in Sherwin Williams Alabaster. 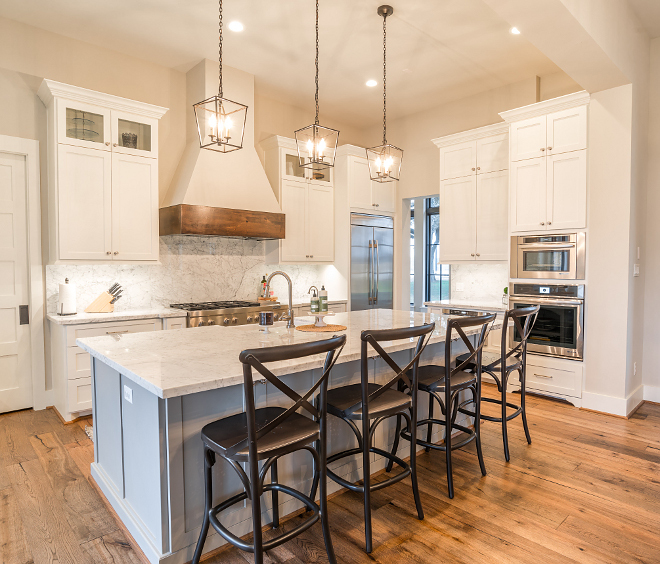 Island Pendants: Visual Comfort (small). Counterstools: Here & Here– Other Inspiring Counterstools: here, here, here, here, here, here, here, here, here, here & here. Appliances: Jenn-Air Kitchen Package – similar here. Wall paint color is Sherwin Williams Agreeable Gray. Ceilings are Sherwin Williams Agreeable Gray – 50% less than wall. Kitchen counters and backsplash is Statuarietto Marble. Notice the side of the island with deep bookshelves. Cabinet Hardware: Knobs – Pulls & Bin Pulls. 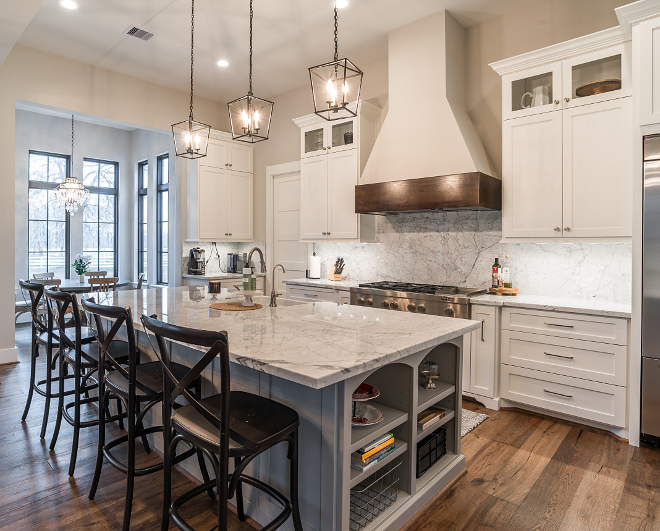 The kitchen opens to an open-concept dining room & family room with rustic beams and stone fireplace. 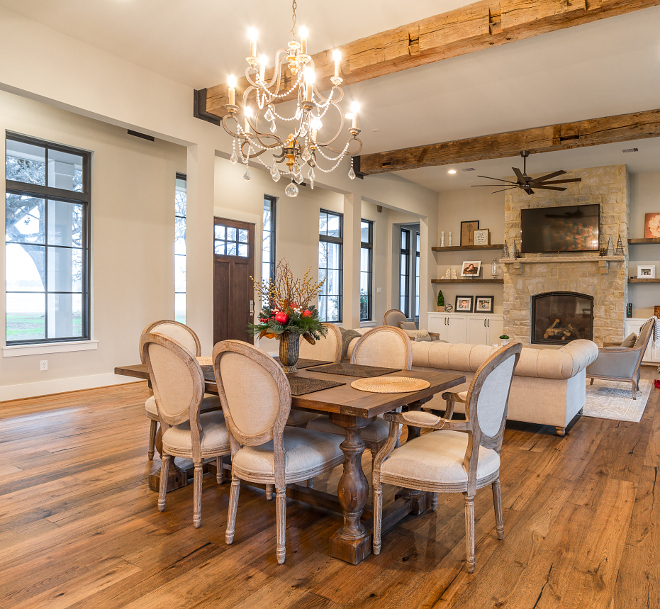 Ceiling Treatment: Reclaimed beams are from a barn in Iowa. Living Room ceiling Fan: Fanimation. Similar Family Room Shelves: Here. Hardwood Flooring: LM Hardwood Nature Reserve BM2U7-s30 Weathered Oak Color Caribou 1/2 x 7 1/4 x 72″ Random Length. 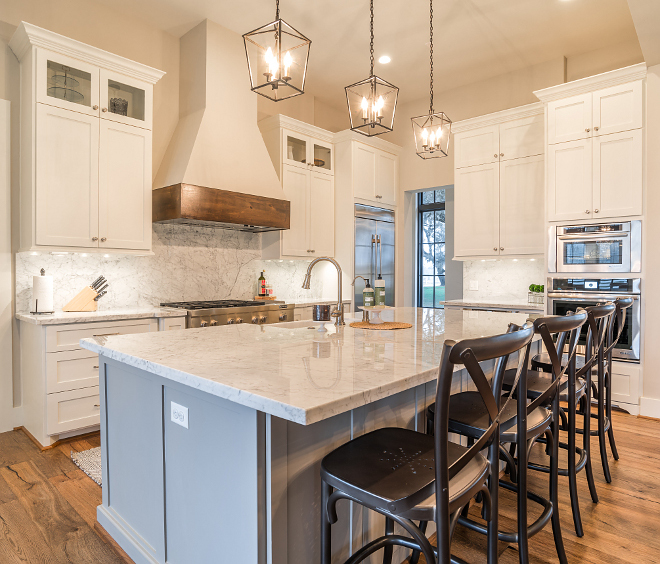 The kitchen island paint color is Sherwin Williams Dorian Gray SW 7017. 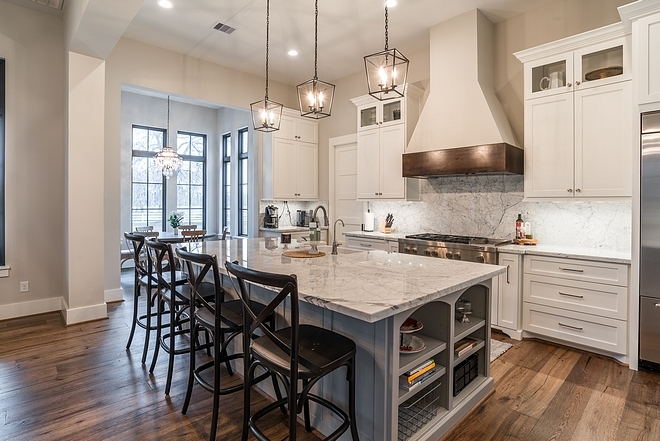 This is actually one of my favorite grey paint colors for cabinetry. Faucet: Mirabelle Pull-Down Kitchen Faucet in Stainless Steel. 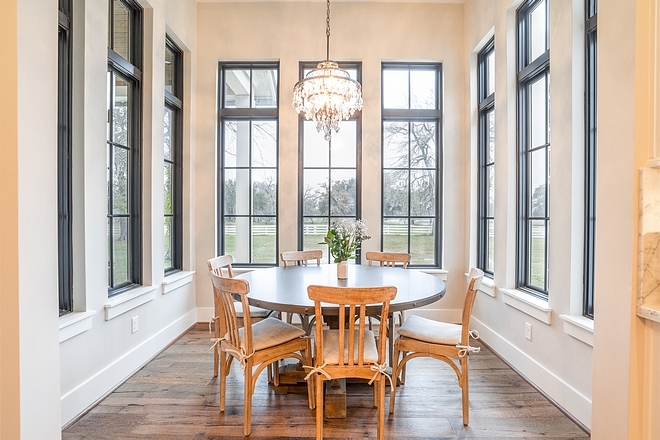 The kitchen opens to a cozy breakfast room with black windows and country vistas. Similar Chandelier: Here, Here, Here, Here & Here. 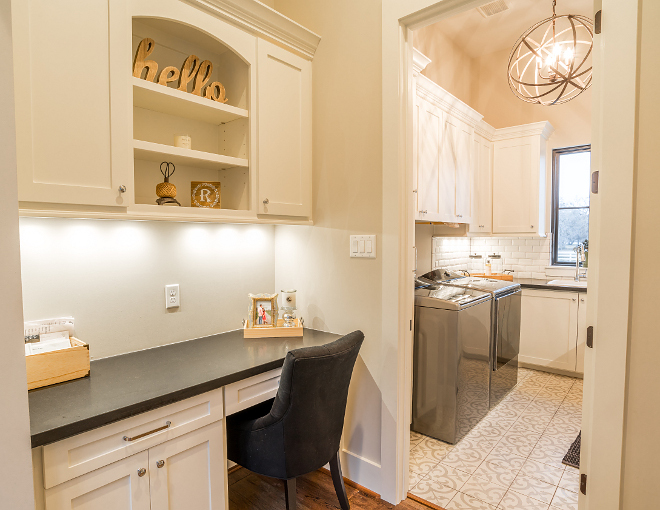 The mudroom room features a drop zone with built-in desk/cabinetry. Cabinet Hardware: Cabinet Hardware: Knobs – Pulls. Laundry Room Chandelier: Capital Lighting. Laundry room features cabinets painted in Sherwin Williams Alabaster and walls are SW Agreeable Gray. Countertop is leathered Black Granite. Paint Color is Mindful Gray SW 7016 Sherwin Williams. Flooring: Shaw Carpet Shadow Z69047 00330 Cellini. Chandelier: Visual Comfort. Similar Chandelier: Here & Here. Similar Beds: Here, Here, Here, Here, Here, Here & Here. 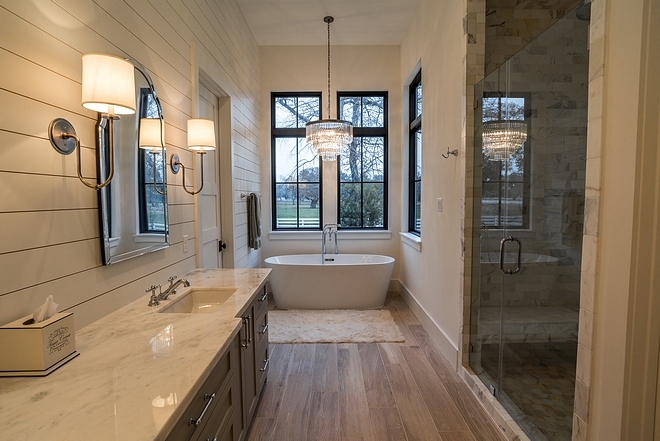 The master bathroom features a very practical layout and beautiful finishing. Grey Bathroom Cabinet Paint Color: Dorian Gray by Sherwin Williams. Floor Tile: Thorntree Casa Dolce Casa Wooden almond natural – similar here & here. 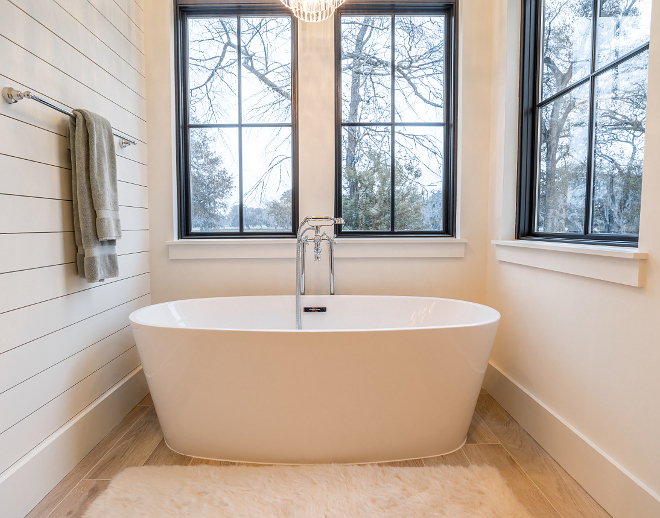 Walls & Ceiling Paint Color: Alabaster by Sherwin Williams SW 7008. Shower Wall Tile: Calacatta gold 3×6 subway – Grout bright white. 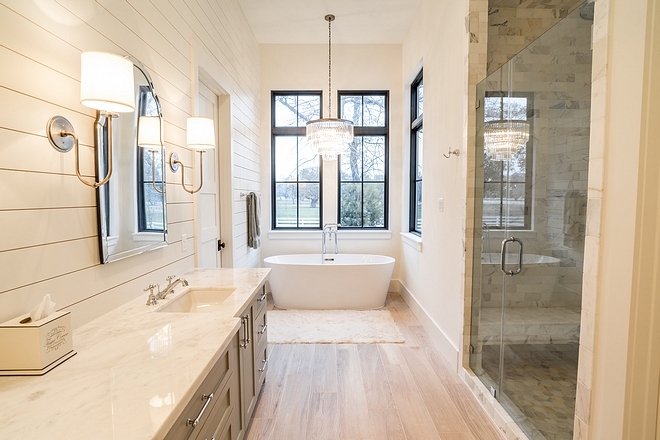 Shower Floor Tile: Calacatta gold hex tile. Grout Bright White. 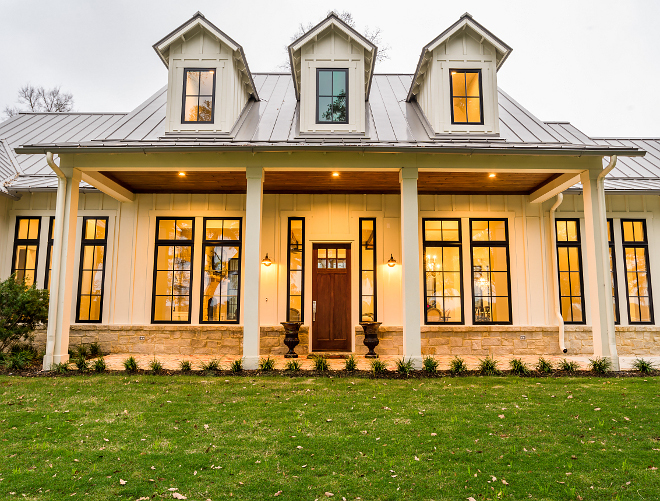 Builder: Builder: William David Homes. Interior Design by: Beth Lindsey Interior Design. 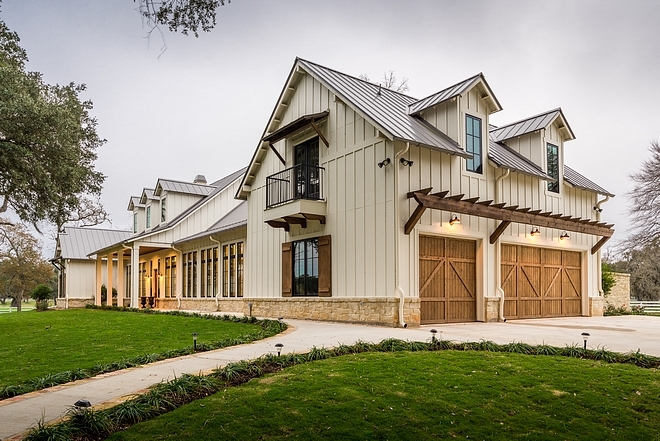 My wife and I love the acreage modern farmhouse look and design. Any idea if there is a floorplan available for a house like this? Thanks! Feel free to contact the architect. He should be able to share this information with you.